A Cook is responsible for the preparation, cooking and presentation of various types of dishes. This involves using different cooking methods such as roasting, broiling, baking and frying and being sufficiently skilled to follow detailed recipes. Cooks work in many different places such as restaurants, hospital kitchens, school and college cafeterias, company dining halls, fast food places, and for catering businesses. 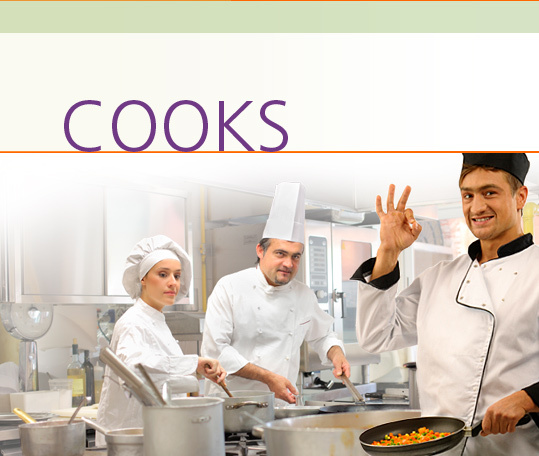 In the Cooks Career Extension, students learn how to interview for a job, and discuss their education, training and work experience. They ask about job responsibilities and discuss company guidelines and policies. They become familiar with work conditions and talk about equipment and supplies. They learn about cleaning and hygiene as well as food preparation and orders. They learn how to handle complaints and talk about their strengths, weaknesses and goals for the future.